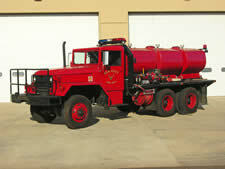 Fire Apparatus Photography supplies over 20,000 individual listings of fire service vehicles. The listings include both US and foreign vehicles taken over many years and constructed by a wide variety of builders on many chassis. The chassis manufacturers include both US and overseas manufacturers. The listings include current commercial chassis builders such as Chevrolet, Dodge, Ford, Freightliner, General Motors, International, Iveco, Kenworth, Mercedes Benz, Peterbilt, Scania and Sterling. Commerical Chassis Builders include Chevrolet, Dodge, Ford, Freightliner, General Motors (GMC), International Harvester (IH), Iveco, Isuzu, Kenworth, MAN, Mack, Mercedes Benz, Peterbilt, Scania, Spartan, Sterling and Unimog. Former builders such as Autocar, Brockway, Dennis, Diamond Reo, Diamond-T, Dodge Brothers, Graham Brothers, Indiana, Kaiser, Kissel, Stewart, Studebaker and White are also throughout the listings. Custom Chassis Builders of today include American La France (ALF), Emergency One (E-1), Ferrara, Kovatch Mobile Equipment (KME) and Pierce. Yesteryear’s builders include Ahrens-Fox, Buffalo, Coast, Crown, Duplex, Ottawa, Pemberton Fabricators (Pemfab), Pirsch and Simon-Duplex. Commercial chassis builders from the past are also included: Autocar, Brockway, Dennis, Diamond-T, Diamond Reo, Dodge Brothers, Federal, Graham Brothers, Kaiser, KIssel, Studebaker and White. We also have the today's custom chassis builders represented such as HME, Emergency-One, Ferrara, KME, Pierce and Rosenbauer. Builders from yesteryear such as Ahrens-Fox, Buffalo, Coast, Crown, Mack, Pirsch and Sanford are present in our listings. 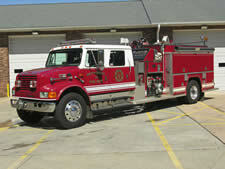 The apparatus builders include both current companies such as 4-Guys, HME Ahrens-Fox, Boise Mobile Equipment (BME), Burton's Fire Apparatus, Central States, Darley, Emergency-One (E-1), Ferrara, Hackney, Hi-Tech, LTI, Marion, Master Body Works, Opperman and Sons, Oshkosh, Pierce, Placer Fire Equipment, Quality, Rosenbauer, S&S, Seagrave, Smeal, Super Vac (SVI), Sutphen, Westates and West-Mark. 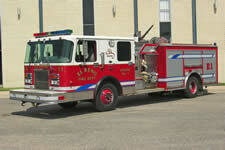 Past apparatus manufacters are well-represented in our listings. They include ALF, Amertek, American, Atlas, B&Z, Beck, Becker, Boardman, Buffalo, Calavar, Clark, Coast, Crown, EEI, Fabco, Fire-Bann, Fire-X, FMC, FTI, FWD, Grumman, GTB, Hahn, Howe, John Bean, L. N. Curtis, Mack, Maxim, Oren, Paoletti, Pirsch, R. D. Murray, Sanford, Swab, Van Pelt and Ward La France (WLF). Apparatus Body Builders represented include companies such as 4-Guys, Ahrens-Fox, Boise Mobile Equipment (BME), Burton’s Fire Apparatus, Central States (Rosenbauer), Darley, Emergency One (E-1), Ferrara, General Safety (Rosenbauer), Hackney, HME, Hi-Tech, Ladder Towers Incorporated (LTI), Marion, Master Body Works (MBW), Opperman and Son, Oshkosh, Pierce, Placer Fire Equipment, Quality, Rosenbauer, S&S, Seagrave, Smeal, Super Vac (SVI), Sutphen, Westates and West-Mark. Past apparatus builders are also well-represented in our listings to include: Amertek, American, Atlas, B&Z, Beck, Becker, Boardman, Buffalo, Calavar, Clark, Crown, EEI, Earl Sherman, Fabco, Fire-Bann, Fire-X, FMC, FTI, FWD, Grumman, Gregory Truck Bodies (GTB), Hahn, Howe, John Bean (FMC), Klein, L. N. Curtis, Mack, Maxim, Oren. G. Paoletti, Pirsch, R. D. Murray, Sanford, Swab, Van Pelt, Ward La France (WLF) and Wesco.